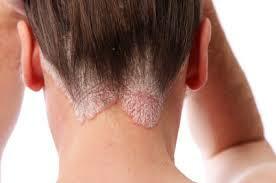 Psoriasis is a chronic skin disease which presents with scaling and inflammation. The inflammation is characterized by pain, swelling, heat and redness. When psoriasis occurs, it causes patches of thick, red skin. These patches which can occur on the scalp, elbows, knees and soles of the feet, can be itchy and painful. Psoriasis affects approximately 2% of U.S population and affects both men and women. Psoriasis occurs as a result of autoimmune reaction. Usually, skin cells grow deep in the skin and rise slowly to the surface, but when psoriasis occurs, the cells rise too quickly and accumulate on the surface. There are different types of psoriasis, there’s the plaque psoriasis, which is characterized by scaly, erythematous patches, papules, and plaques which may sometimes be pluritic. There is also the inverse kind of psoriasis where the lesions are located in the skin folds. Other types include erythrodermic which is characterized by generalized erythema that covers nearly the entire body surface area and Pustular which presents with apparent pustules and often triggered by corticosteroid withdrawal. Different types of psoriasis require different mode of treatment and present with varying symptoms. On our website, we have drafted a well detailed guide to help you as you battle with psoriasis. Though it is a chronic disease, we want you to understand that you can lead a normal life with the right management and treatment options. If you are struggling with the unbearable symptoms of scalp psoriasis, you will find the best natural remedies and tips on how to choose the best hair products. You can find other available options of management here.